"More than the cake, I wanted to savor more of you!" On the way home, Takuya and his little brother came across with Keisuke, a red-haired patissier in the park. Despite his gaudy appearance, the sweetness of his strawberry cake captivated the two brothers, forcing Takuya to splurted out his honest opinion. Attracted by Takuya detailed evaluation, Keisuke asked him to be his permanent tester. At first, Takuya did not buy the idea, but why does he end up going to Keisuke's shop every day? Does he only want to eat cake with Yuta? Or maybe it has any connection with this growing tightening feeling in his chest? 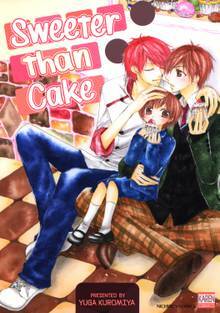 "Sweeter than Cake" is a sweet paradise for readers who loved children and sweets featuring in BL manga. It is one of the best heart-healer you can have! When they were kids, Chiaki promised Natsuki to take him as a bride when they grow up. Years later, Chiaki had grown into a bitter working adult and a certain circumstance forced him to stay together with Natsuki, who is now working as a model. One day, suddenly Natsuki was feeling feverish and wanted Chiaki to make him feel better by touching his body. Unable to resist the temptation, Chiaki succumbed to the temporary pleasure. Now things had become awkward between them, Chiaki starts reminiscing about their promise. Does Natsuki still feel the same as back then? Takeru Mamiya is very excited to take Pastry class not only because of the cakes but also because he likes to imagine dirty things about the cute trainer, Mitsuru. But his over-imagination was found out by the other trainer, Kita. "Mitsuru is my boyfriend so I can't let you lay hands on him," said Kita while kissing Takeru. Although Mitsuru is the one Takeru desired, why couldn't he forget Kita's spicy touches? Kei has this three-years unrequited feeling towards his cool and intelligent classmate, Kyoji. He did not have any intention to confess at all until his family suddenly decided to move... Kei finally took the risk to spill everything! Will the love bloom between them or will Kei lose their friendship instead?